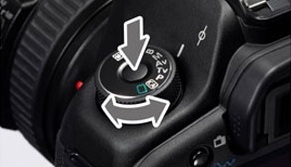 The Canon 60D was the first Canon camera to add the new Dial Lock feature. This requires you to push down a button before moving the dial wheel and prevents accidentally changing the mode on your camera. If you want to add this feature to your existing 5D MkII or 7D, Canon is offering the upgrade for a $100 fee.